ITP is pleased to announce the release of a new set of fact sheets and images, Hispine Pests of Palms. 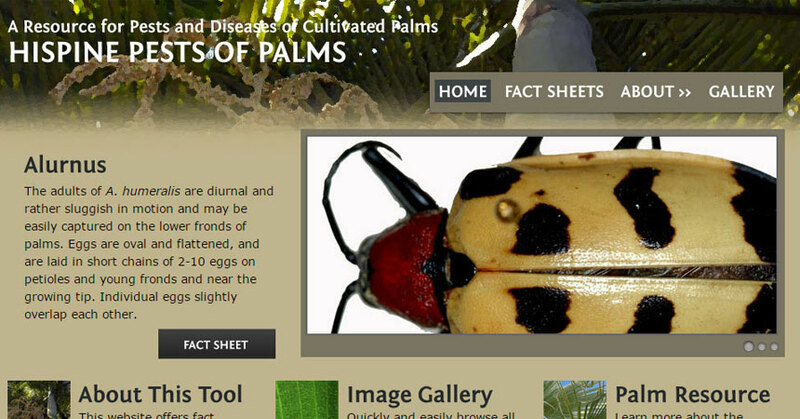 This website focuses on the chrysomelid pests of palms, which are the most important beetle family that consumes leaves of palms. Many members of the former subfamily Hispinae, referred to here as hispines, are leaf miners on palms. It includes 23 fact sheets for each of the chrysoemlid genera that includes palm leaf miners. Several hispine palm pests have been introduced to other areas via commerce. They are species of concern for many palm growing areas. Southeast Asia and the Pacific are particularly affected. Coconut production losses due to Brontispa longissima have been recorded to be as high as 30% to 50% in Vietnam and 50% to 70% in Samoa. Infestation has the potential to have a drastic effect on the livelihoods of whole villages; in some localities 90% of the people rely on the coconut for their livelihood. Hispine Pests of Palms is part of the commodity-based A Resource for Pests and Diseases of Cultivated Palms.